When it comes to social media marketing trends, Stories is the big one you need to watch. More than 1.12 billion accounts spread across Snapchat, Instagram, Facebook, Facebook Messenger and WhatsApp now watch or create Stories every day, representing a 987% increase since the start of 2016. It isn’t just individual users that are causing Stories to grow hugely in popularity, more brands, companies and marketers are making the most of them. 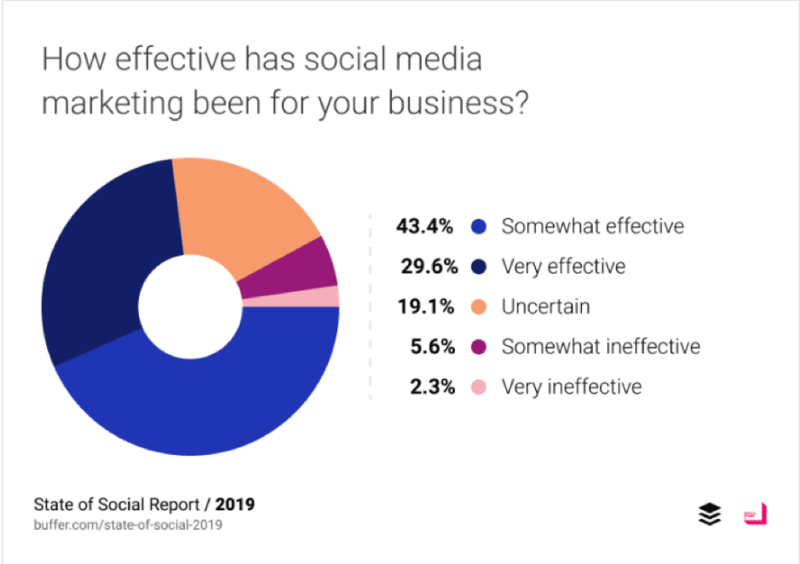 Buffer’s State of Social 2019 report has found that 57% of brands have found that Stories have been an "effective" part of their social media strategy. Of the 1,800 marketers surveyed for the report, 22.6% of those who have used Stories as part of their social media marketing strategy have found that they have been "very effective". A further 35% said they were "somewhat effective". While these are fairly positive findings, over a quarter (34.6%) of marketers are unsure as to whether or not their use of Stories has been successful. This suggests that some marketers may be uncertain as to how to measure the success of Stories or may not have the right goals and strategy in place. As with any aspect of social media, understanding why you are using Stories is vital to getting the most out of them and creating the right strategy for your brand. Positively though, only 5.8% of brands said that Stories are "somewhat ineffective" and 1.9% find them to be "very ineffective", showing that looking into a Stories strategy as part of your wider social media efforts could be beneficial – so long as you have the right goals and KPIs in place. Despite the introduction of promoted Stories, very few marketers are choosing to invest in them. Some 62.9% of respondents said that they haven’t used Stories ads at all, suggesting an untapped resource when you consider the high volume of users checking in with Stories every day. 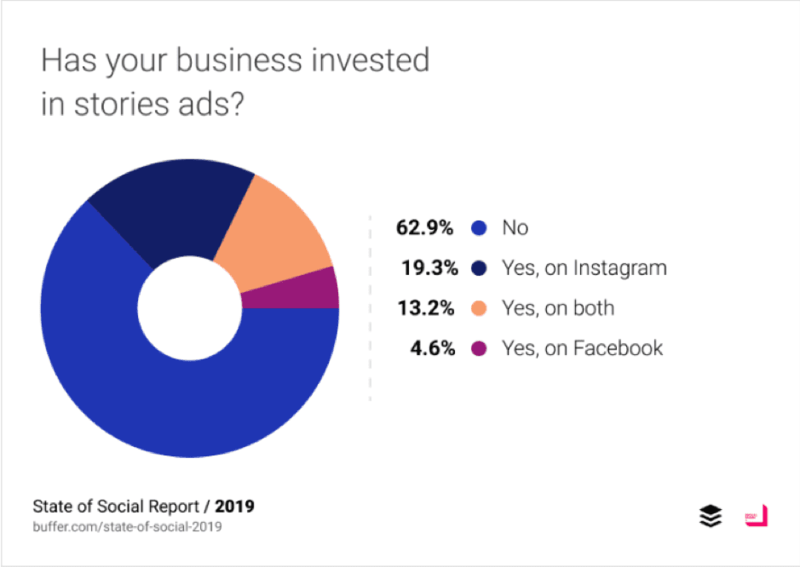 Only 19.3% have used Instagram Stories ads, 4.6% have promoted Stories on Facebook and just 13.2% have invested in Stories ads across both platforms. 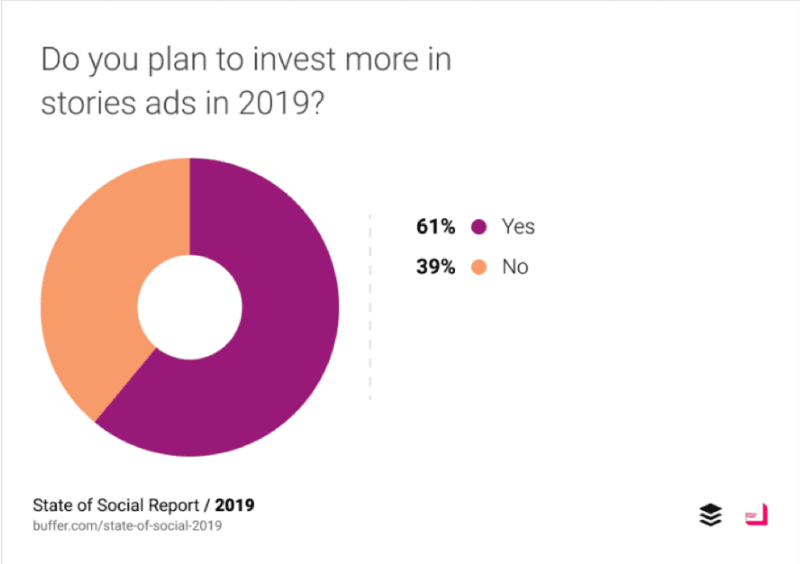 However, 61% also said they intend to start using promoted Stories in 2019, suggesting that more marketers are starting to see the benefits of paying to get this type of content in front of more people. It’s important to note, though, that promoting Stories when you haven’t seen the best results from them organically may not be the best option. After all, it could well be that the type of content you’re producing for Stories isn’t resonating with your audience, which is why they are ineffective. Ensure you explore more with the content you’re creating for Stories, so you know what works and what doesn’t – just as you would with posts on your feed. Mirroring posts that are organically successful should help to increase engagement. As well as Stories, Buffer’s research looked into messenger apps, which are still being overlooked by marketers. More and more social media users are now choosing to share content or talk to friends via messenger apps as opposed to their social media feeds. This has meant a rise in Facebook Messenger and WhatsApp users, an increase that brands are not fully taking advantage of. Only 28.6% of respondents are using messaging apps for their marketing, meaning nearly three-quarters (71.4%) are missing out on a range of benefits. 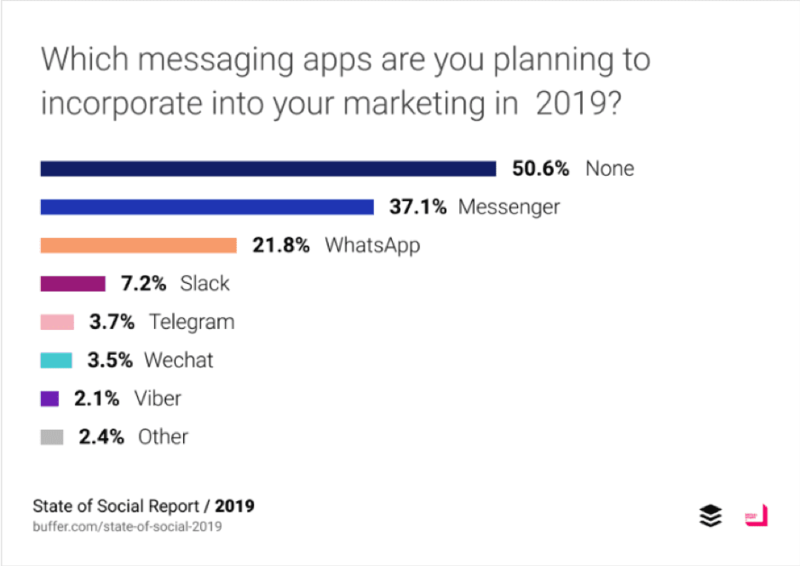 Further to this, 50.6% of brands are not planning on using messenger apps as part of their marketing in 2019. Messenger apps can be used as a way of delivering a more personal experience for customers or followers, allowing brands to deliver offers and product suggestions in a way that tends to see high engagement. In fact, Buffer’s research found that Social Chain has used a WhatsApp group within its marketing plan, which has seen an open rate of more than 98% and a click-through rate of 25%. They can also be used to provide high-quality and fast customer service, which is important as 37% of customers who complain to or question a brand via social media expect a response in under 30 minutes. Using messenger apps to respond to queries or customer issues helps to remove your responses from the public sphere and ensure you can deliver the best possible customer service. Head of marketing at Social Chain, Peter Daly said that he expects more brands to start using messenger apps as part of their strategies this year: "We fully expect messaging apps to realize their potential in 2019; the requirement to actively opt-in means users are much more engaged in these private spaces that they are when scrolling through a news feed, making it easier for brands to build direct and meaningful relationships with their customers quickly, on a mobile-first basis." When it comes to marketing products or services, over a third (37.2%) of brands have made use of influencer marketing. Of those who have used this method, almost half (45.2%) have found it to be "somewhat effective" and 23% said it was "very effective". 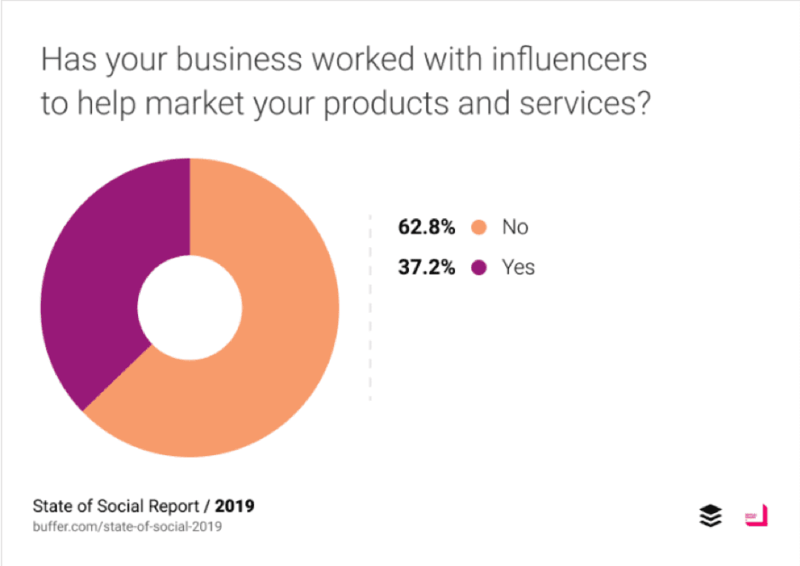 Brands are also intending to continue to use this type of marketing, with 88% of those who have used influencer marketing previously planning on including it in their strategy for this year. However, there is a fair amount of confusion when it comes to the guidelines for using influencer marketing. Only 6% say that influencer marketing guidelines are "very clear" while 44.8% say they are "unclear". This suggests there is a lot of confusion over what marketers can and cannot do in terms of using influencers to promote their services or products. As with any tool or marketing style, it is important to understand the rules in terms of what you can and cannot do – especially as social media platforms are cracking down on non-transparent influencer campaigns. Ensure that any blogs, content or social posts created by influencers you’re working with clearly state that they are promoted. When it comes to content, video is still the king the castle, as shown by fact that only 14.5% of brands don’t publish any videos. This has reduced from the 25% that didn’t post videos at the same time last year, showing that this form of content continues to be on the rise. 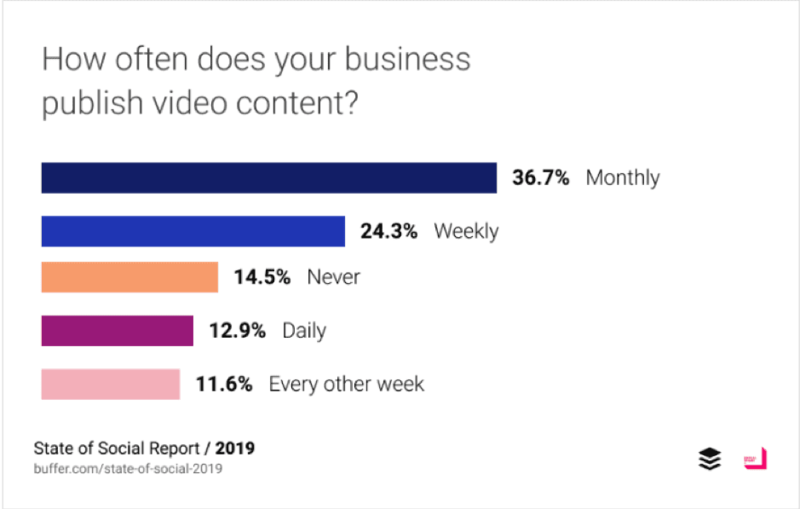 The vast majority of brands post videos on social media on a monthly basis, with 36.7% saying this is their current strategy, while 24.3% post weekly videos. In terms of the most popular platform for video content, Facebook is leading the way with 81% choosing to post videos to it. In fact, Facebook beats YouTube, which sees just 62% of businesses sharing video content. However, when it comes to engagement, LinkedIn could be the ideal social media platform to share video content on. Currently, only 32% of marketers post videos to LinkedIn, but videos on this platform get shared over 20 times more than any other form of content, making it a great choice for B2B marketers. 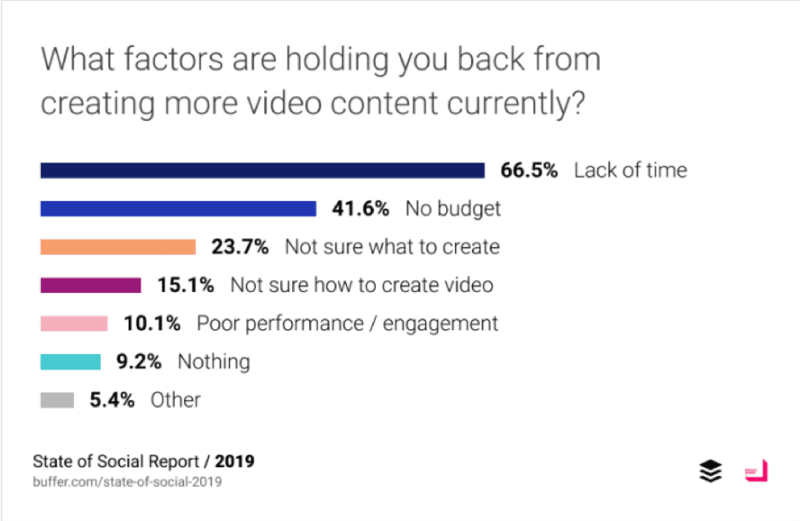 When it comes to why brands are failing to produce more video content, lack of time is cited as being the main reason by 66.5% of respondents. Some 41.6% also said that a lack of budget was a big factor when it came to creating video. While video is a time-consuming and relatively expensive form of content – although there are ways to create it on a smaller budget – so you need to balance up the likely ROI of using video as part of your social media strategy. 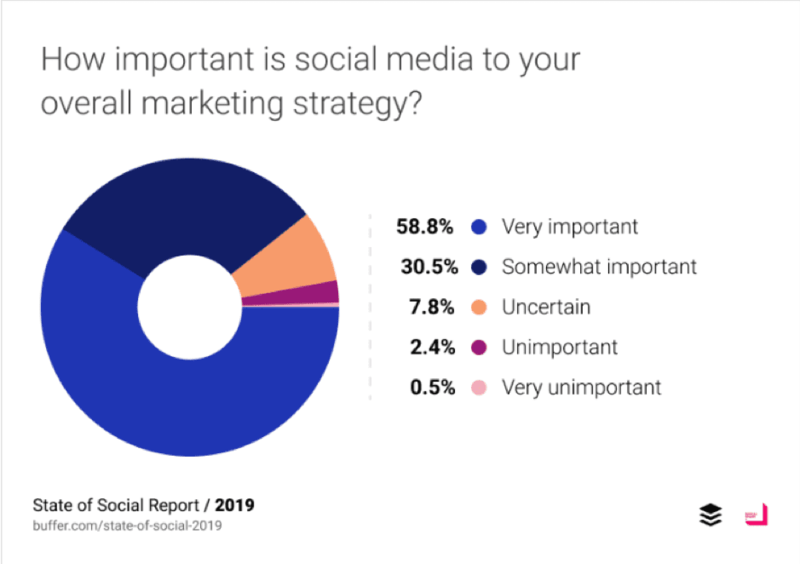 The rise of social media is still ongoing, so it’s probably no surprise that 58.8% of marketers say that it is a "very important" part of their overall marketing strategy. In fact, just 2.4% say it is "unimportant" and only 0.5% say it is "very unimportant". Social media offers you opportunities to get your brand, services or products in front of a new audience, provide quick and effective customer service, start conversations and improve the number of people heading to your website. There are a huge number of ways to use social media, as well as plenty of different platforms to utilize, so there is likely to be plenty of options no matter what type of business you have. Although the importance of social media to marketing is indisputable, a many marketers still don’t know how to measure its effectiveness. Of those respondents who utilize social media as part of their marketing strategy, 19.1% said they are uncertain as to how effective it has been. This shows that there still needs to be a better understanding of how to use social media analytics and how to set up campaigns using tools like UTM links in order to better track results. As well as causing issues with the reporting of your performance, this lack of understanding could also affect buy-in from managers and other decision makers. Overall, this could mean you don’t get the social media marketing budget required to really make a difference and make the most of effective tools – such as video and promoted Stories. 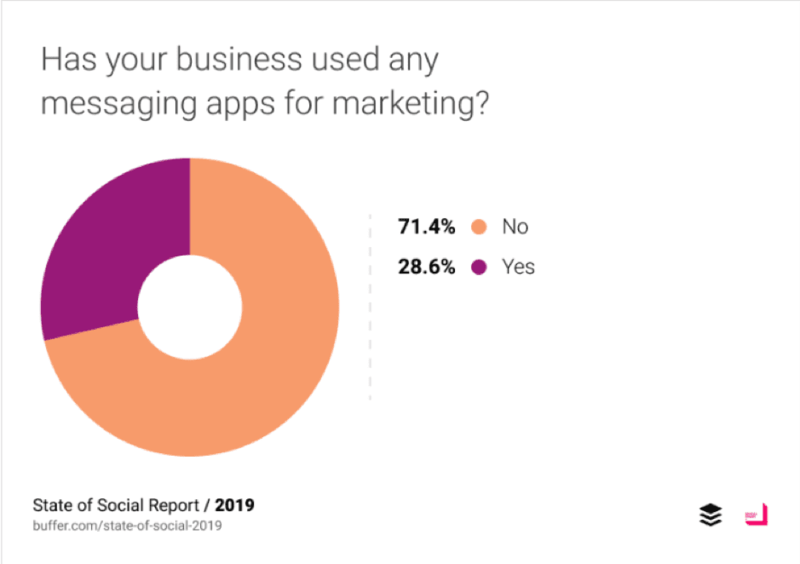 Buffer’s report highlights some interesting points and shows that you should be considering how best to use Stories, messenger apps and videos as part of your overall marketing strategy. While the fact that so many people now use one or more social media platforms on a daily basis is a great thing for marketers utilizing the power of social, it also means that you need to do more to stand out from the crowd. Adopting new trends as early as possible and experimenting to find the right content mix for your brand can help ensure that you see the best results. As well as developing a plan, setting up your analytics to track the success of your social media strategy is also vital. Make sure that standard tracking is correct and that any campaigns can be tracked separately in order to fully display the benefits of different content types and marketing messages.